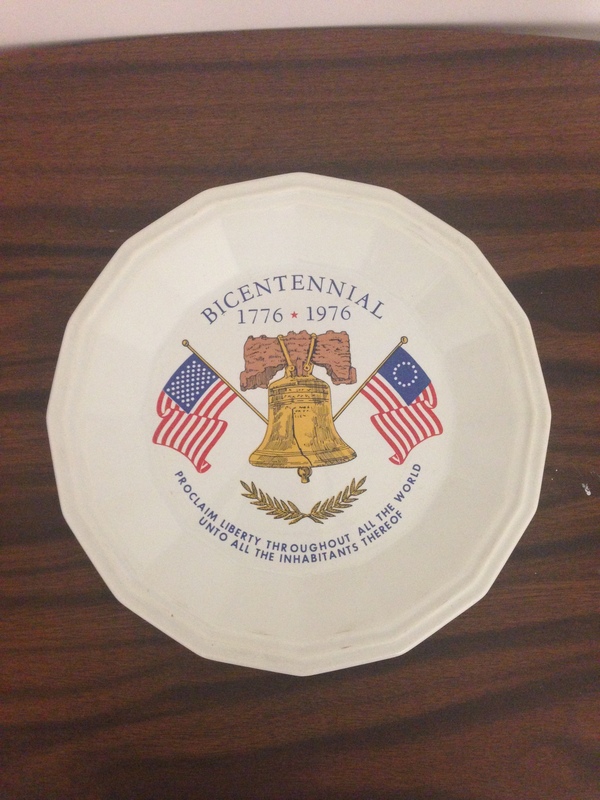 My focus on the Bicentennial Junk Collection concerns two historical plates. The first plate is a porcelain plate with an image of the Liberty Bell with both the colonial and current American flags on each end. 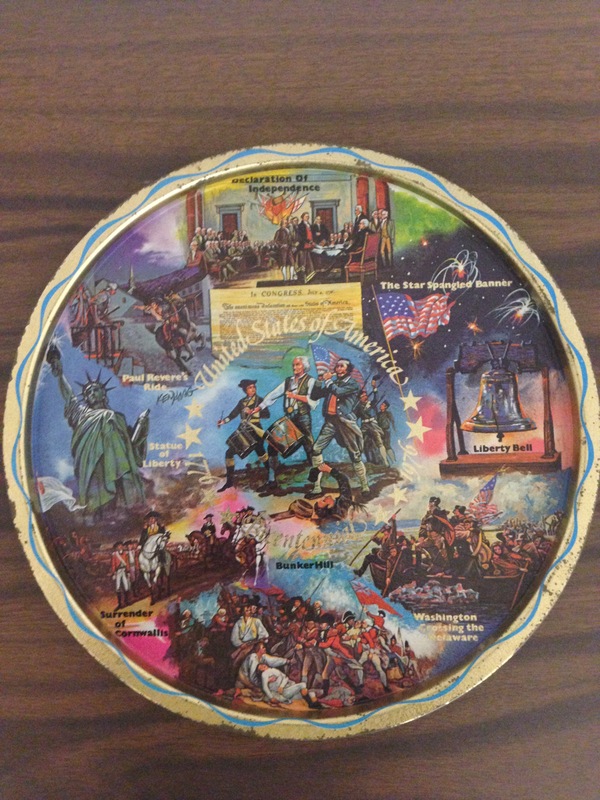 The other plate is a souvenir tray that has various images of American events, mostly of the Revolutionary War era such as Paul Revere’s ride, the Statue of Liberty, Cornwallis’ Surrender, Bunker Hill, Declaration of Independence and others. The theme of collecting for Dr. Crepeau was “wanting to preserve some of that [bicentennial] spirit for future generations”. Dr. Leland D. Peterson adds that future generations must understand that the bicentennial was necessary to celebrate where America has come within the last hundred years, despite the mixed bag of America’s triumphs and low points. Forty years removed from 1976, people can still appreciate the euphoria that took place in the mid-1970’s by looking at the collection. It is clear that during the 1970’s, the United States, as a capitalistic society, took advantage of the demand for patriotic memorabilia. Tammy Gordon presents in her book Spirit of 1976, the commercialization that took place leading up to the bicentennial. She states how the bicentennial featured “tag lines [that] evoked the founding fathers, the Revolution, the Declaration of Independence”. This perfectly describes our bicentennial plate which was created in response to this commercialization. Today, the plates no longer carry the same euphoria as in 1976 in a post-modern society. Also, perhaps the prices of the plates were greater in value monetary than in present times with current prices for sale online ranging from $15 to $25 for the porcelain plate and $10 for the souvenir tray. There is no significant monetary value for these plates anymore, but someone is willing to pay these prices to have a piece of bicentennial history, which helps fulfill the prophecy spoken by Dr. Crepeau. Yet for the company that made the porcelain plate, production may have been more of a golden opportunity than just capitalism. Perhaps individuals take for granted that the plate was made in the USA, but in the context of the 1970’s, this is significant. The porcelain plate was made by the company Homer Laughlin who outlines in their history how difficult the 1960’s and 1970’s were for their business. America had begun to import tons of low-cost, foreign imports that threatened the business of homegrown companies like Homer Laughlin. The opportunity to produce home manufactured, patriotic memorabilia such as the plate, in the USA served simply as an opportunity to stay afloat. America is a country known as a melting pot of many different cultures bringing their own traditions and cultures. However, often when America’s story is told, there are certain memories that are championed more than others. The souvenir tray can be used as a learning tool to teach the real American story, describing what is on the plate, and what should be on the plate. The 1970’s were a period where minority groups (women, African-Americans, Native Americans) demanded representation in the national narrative. Forty years later, we can tell the American story that includes everyone, not just a dominant White Anglo-Saxon story. At the end of the day, these plates, once used for capitalistic purposes can be reinterpreted and reinforced as a memento and as a learning mechanism.